Art Nouveau ("new art" from French) is a style of art and philosophy, which arose in the second half of the XIX century and had been reigning till the beginning of World War I. Its distinctive features include decorativeness, free lines and round shapes, their plasticity and flow. Art Nouveau abounds in opulent ornaments and decorations; it is focused on plants and natural motifs; and the depicted figures are flat like in posters or stained glass panels. 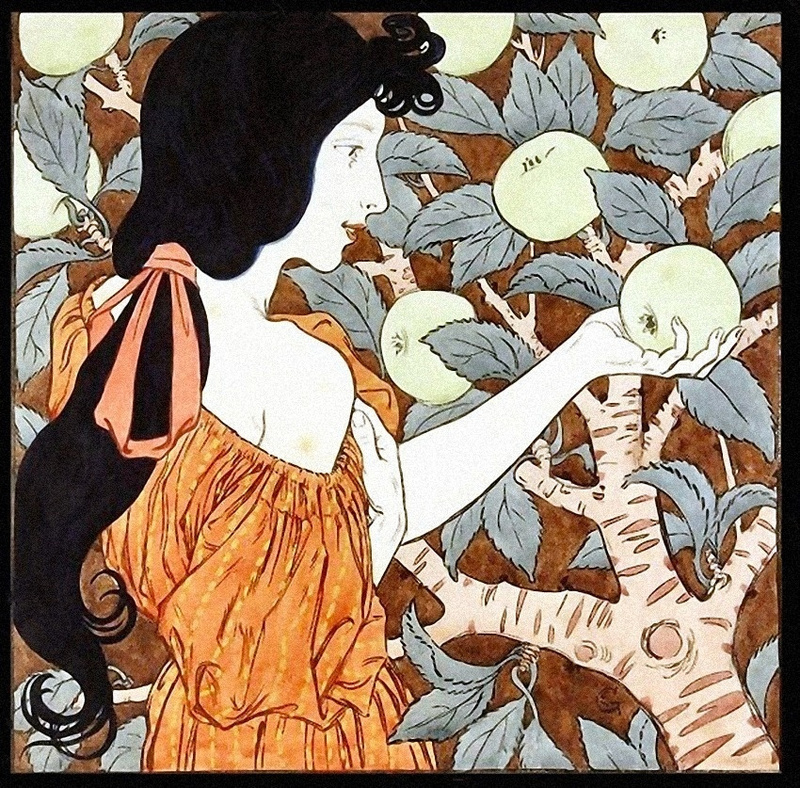 Like in Symbolism, allegories and fantasies are the most popular subject matters in Art Nouveau; ladies are portrayed as goddesses and images are still like decorations or frozen theatrical performances based on myths and legends, romantic and mystical stories, and fantasies. 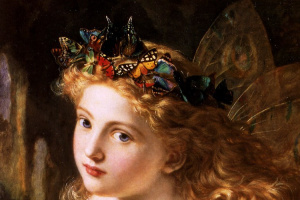 Even minor details in a painting sometimes bear a supplementary sense like an ornament of flower buds symbolizing a new life. When it comes to Art Nouveau, one might have a typical image of a languid beauty dressed in flowing clothes in the frame of twisted branches, flowers and ornaments like in Celtic or Greek mythology, with the Renaissance and Gothic motifs or in the style of Japanese or Egyptian art. Are Alphonse Mucha and Gustav Klimt’s artworks brought to your memory? Right you are! Art Nouveau is a unique movement covering arts and humanities ranging from fine art, applied and decorative arts to architecture. Lamps under green shades supported with figures of women in tunics, jewelry masterpieces in the shapes of Bluebirds decorated with curly feathers, chairs with whimsical backs, ornamented bas-reliefs… Being a "designed" movement in a lot of aspects, Art Nouveau has been focused on making the life depicted in artworks much more beautiful than in reality. It was targeted at making a routine life better by new standards offering the middle class, customers of consumer goods, a unified style and harmony grounded on naturalism instead of chaos of the eclecticism. Having spread widely all over the world at one stroke, Art Nouveau was entitled differently in different countries and represented by different bright artists: the Vienna Secession (the Secessionsstil formed by a group of Austrian artists with their first president Gustav Klimt); the Tiffany style (in the U.S.A., pioneered by Louis Comfort Tiffany, the famous designer of stained glass windows and lamps), the Art Nouveau (in France Hector Guimard was a pioneer of this style in architecture), the Jugendstil (in Germany it was called in 1896 after the popular German art magazine, Franz Stuck was a pioneer of the style); the Modern Style (in England it was represented by Aubrey Beardsley); in Italy it was called the Liberty Style; the Modernismo in Spain (Antoni Gaudi); in the Netherlands it was entitled the Nieuwe Kunst and the Style Sapin was introduced in late-19th-century in Switzerland by its pioneer Ferdinand Hodler. The all round development of mass manufacturing and publishing business in particular with its advertisements (like, put a magazine with modern art pictures on the gorgeous table of the same style) boosted Art Nouveau. So called International Exhibitions held in different cities, introducing new trends in all fields of science, culture and art added to the trend. 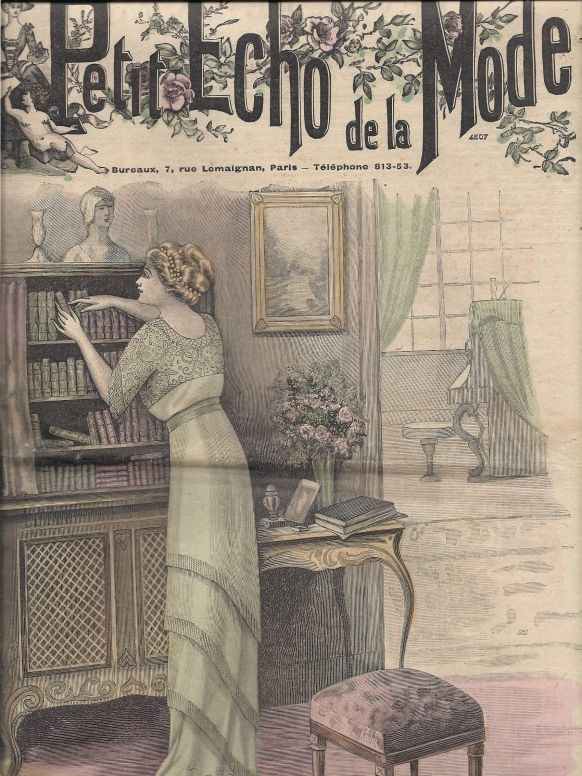 Technical progress, especially in photography and printing, also resulted in the popularity of Art Nouveau with its flat or two-dimentional images. An artist needed no sitter any longer, just a photograph was enough for fast depiction of a portrait (We are right, Mr. Mucha, are not we?) to be published as advertisements, in magazines, posters and whatnot else all over the world. 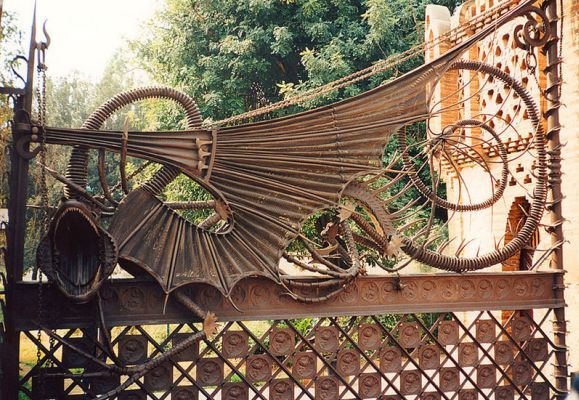 The term Art Nouveau was introduced for the first time by the French Journal de l’art moderne in 1881, it was mentioned in the article about the artists Henry van de Velde, Victor Horta, Eugène Grasset and Hector Guimard. To tell the truth, we could find a clear influence of Japonism on the French Art Nouveau. Once in 1856, Félix Bracquemond, a French painter and etcher, stumbled across colored woodblock-prints by Katsushika Hokusai used for tea packing. Bracquemond showed his findings to his art fellows attracting their attention to the lines and shapes. Their interest was supported by S. Bing, a German art dealer, who opened a shop in Paris offering a lot of Chinese and Japanese small things and paintings, as Japan had opened its borders for foreigners and finished the era of its isolation from the whole world boosting the interest to its art. 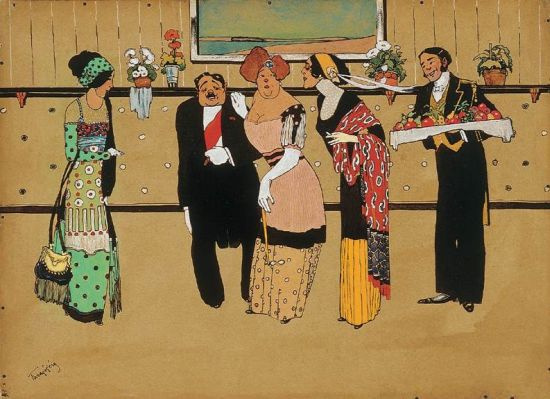 Quite soon those artists we used to call impressionists started mastering the Japonisme or the Japanese style. Following the Japanese methods of painting, Edgar Degas, Paul Gauguin, Édouard Manet, Henri de Toulouse-Lautrec and Vincent van Gogh began to incorporate these techniques into their own work with their curve lines, foliage patterns and combination of flat areas of colour. 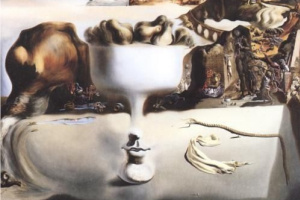 Taking into account that Alphonse Mucha, a Czech Art Nouveau painter and decorative artist, studied in Paris that time and shared a room with van Gogh, we dare to say that the history of Modern Art took another twist. 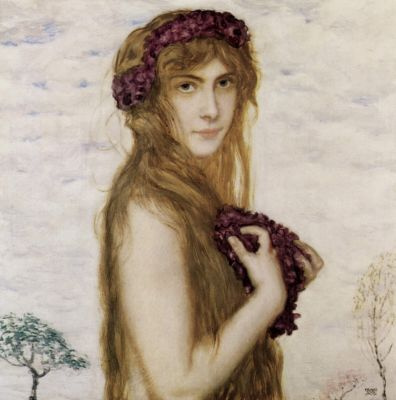 In Vienna a group of artists headed by Gustav Klimt founded the Vienna Secession (in 1897). 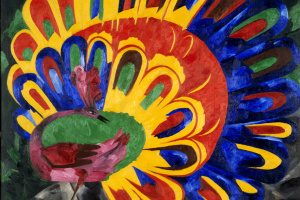 They rejected the academic art principles and introduced their modern seeing and held exhibitions of their artworks in a Secession House specially built for that purposes. England introduced a new wave in art in publishing business: established in 1882, the Century Guild of Artists published a quarterly magazine called "The Hobby Horse" which featured engravings by Selwyn Image. 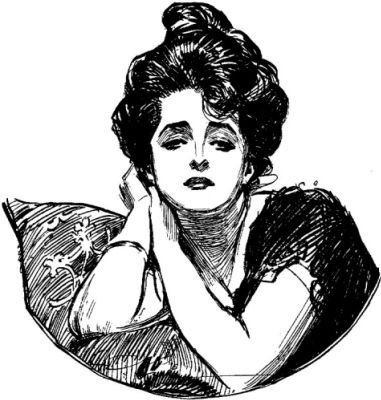 In America in late 1880s the Gibson Girl’s images started their international march with flying colours; paintings by Charles Dana Gibson published in the Life magazine initiated new standards of modern beauty. It was Antonio Gaudí in Spain and Stanisław Wyspiański in Poland, unique and talented artists, who represented the new style. In Russia Art Nouveau was the first bourgeois or merchant style citing all styles from Renaissance to Classicism teemed with symbolism and admiration of nature so dear to the Russian heart. 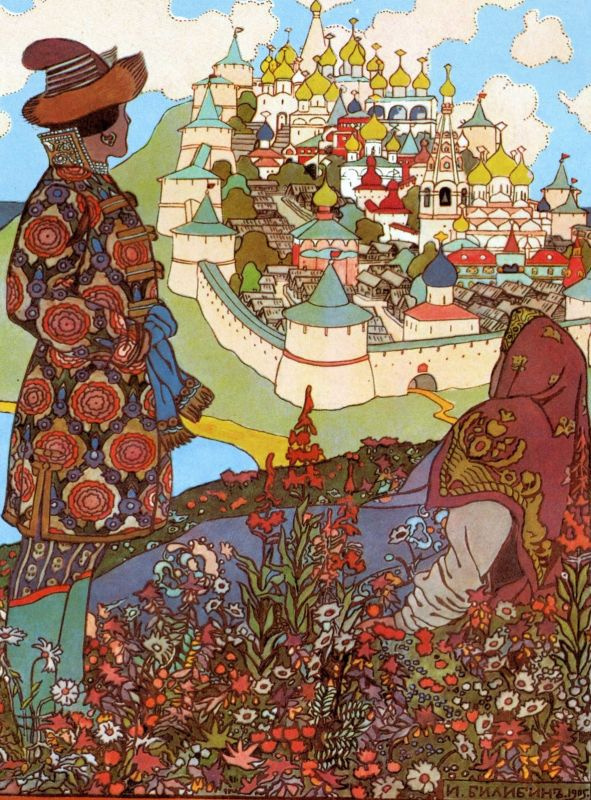 The movement Mir Iskusstva (the World of Art) consolidated Russian aesthetic artists of different genres including Alexandre Benois, Konstantin Somov, Zinaida Serebriakova, Léon Bakst, Viktor Vasnetsov and Ivan Bilibin, the artists who were inspired by Slavic folklore and fairy tales, Mikhail Vrubel, famous for his mystical paintings, Valentin Serov, a portrait artist, Isaac Levitan, a landscape painter and others; these are the many faces of the Russian Art Nouveau. Hermann Obrist — the Red Cyclamen or the Whiplash (Cyclamen, 1892): a tapestry with silk embroidery. 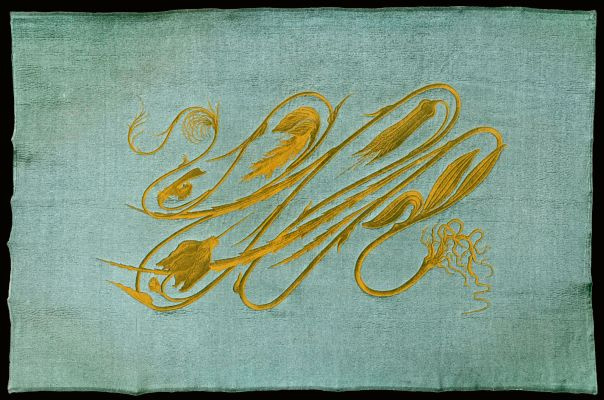 It is a carte-de-visite of the Art Nouveau style; a sinuous flourish of hairpin curves inspired by cyclamen stems without a single straight line or angle. Gustav Klimt — The Kiss (Lovers), 1908 — the most famous and typical painting of the artist whose name is associated with Art Nouveau style. 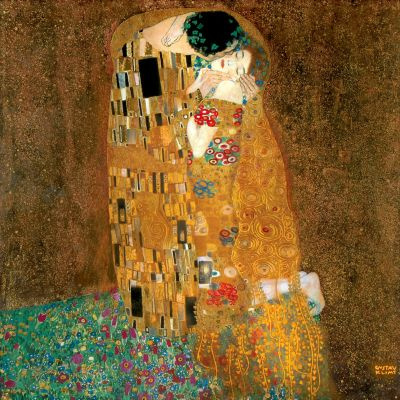 The artwork is the last in Klimt’s Golden Period cycle. 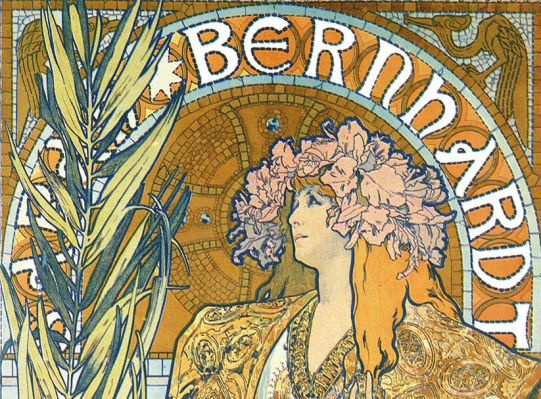 Alfons Mucha — Gismonda, 1894 — is a poster for the performance of the same name depicting Sarah Bernhardt. 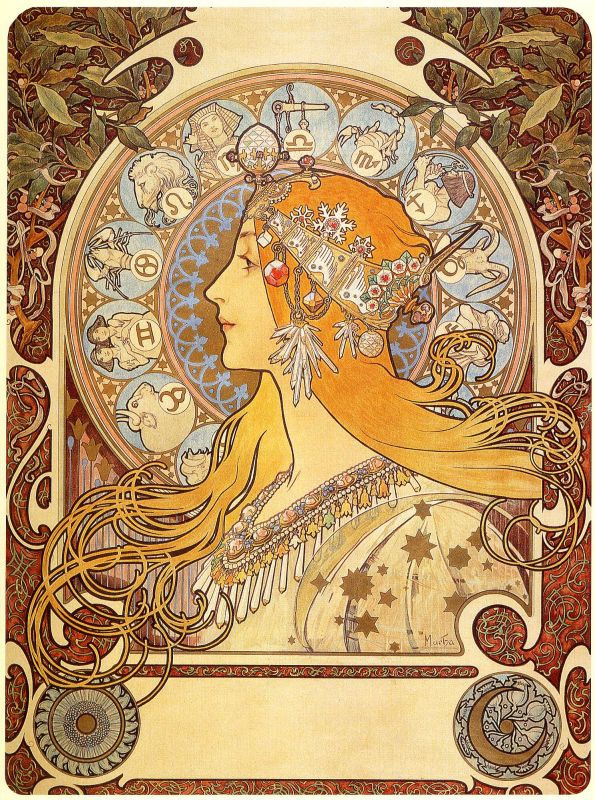 The poster made the Czech Art Nouveau artist, who lived in Paris that time, wildly popular and his artworks embodied Art Nouveau style. — you are in doubt whether Henri de Toulouse-Lautrec's artworks belong to Art Nouveau style or not. 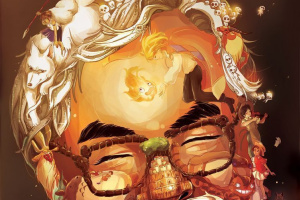 Certainly, his posters are teemed with flat figures and some curved lines, though you can find a lot of angles, dynamics and expression with the lack of symbolism in his subjects. His oeuvre does not fit the modern ways of admiration of moment stillness. Moreover, Henri de Toulouse-Lautrec always mocked at aesthetic sophistication, the principal idea of Art Nouveau. — you confuse Art Deco and Art Nouveau! Serial products of art for consumption by anyone cannot be compared to the exclusive findings in interior design with ivory inlays, snake skin and precious metals in Art Nouveau! You can already find triangles and squares in Art Deco ornaments. — USD 135 million was the sum paid for the Portrait of Adele Bloch-Bauer (1907) by Gustav Klimt (the artwork was housed at the Galerie Belvedere and then was sold by Bloch-Bauer heir Maria Altmann, who gained suit at law for the return of the work by Klimt). — USD 7, 327 million was the price of the Rainbow by Konstantin Somov (Сhristie's, 2007). 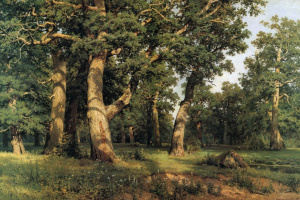 That was a record price for a work at an auction of Russian art at the time. A study is an exercise painting that helps the painter better understand the object he or she paints. It is simple and clear, like sample letters in a school student’s copybook. Rough and ready, not detailed, with every stroke being to the point, a study is a proven method of touching the world and making a catalogue of it. However, in art history, the status of the study is vague and open to interpretation. Despite its auxiliary role, a study is sometimes viewed as something far more significant than the finished piece. 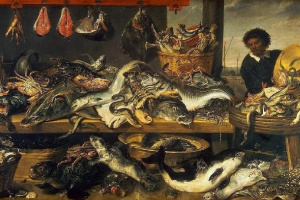 Then, within an impressive frame, it is placed on a museum wall. 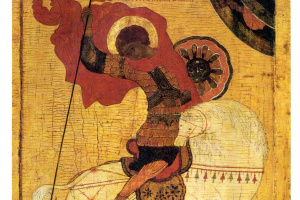 to the Introduction of the Slavonic Liturgy from the Slav Epic cycle in 2013. 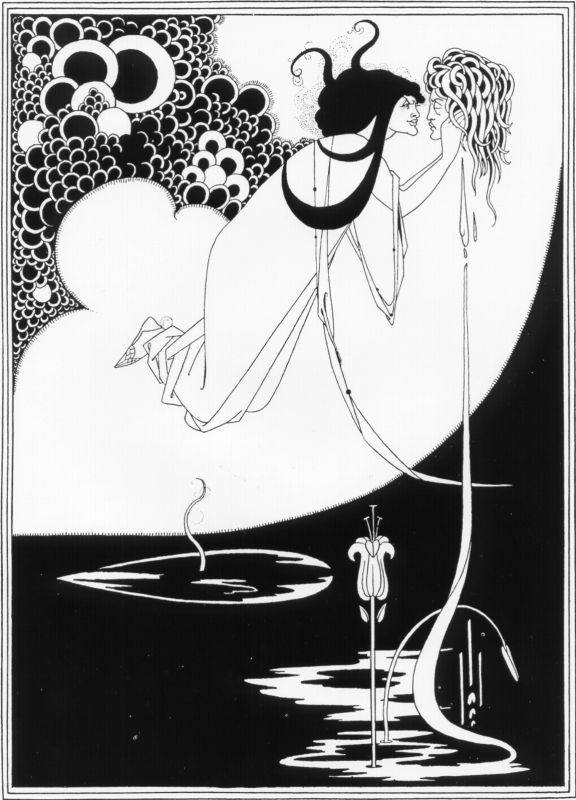 In 2008, a buyer paid USD 300K for two sought-after illustrations for Oscar Wilde’s Salome by Aubrey Beardsley (1894) from his cycle Salome. Two masterpieces (the Climax and the Platonic Lament) deemed to be lost, were occasionally found by an expert in a flat of a British pensioner decorating the walls of his … toilet room. Vienna could be deprived of its ownership for the most celebrated Beethoven Frieze (1902), a series of frescoes by Gustav Klimt at its permanent installation in the Vienna Secession House. Lederer heirs filed a claim for the return of the frieze, after Austria amended its restitution law in 2009 to apply to property that was sold at a discount because of export bans. The Austrian manufacturer and Klimt’s patron bought the panel in 1915. The Beethoven Frieze was looted by the Nazis but returned to the family after World War ll. In 1973, it was bought from the family by the Republic of Austria "under pressure and at a cut-rate price" (according to Lederer’s heirs). The nuance was in that it was the unofficial condition of the agreement on exportation of the entire collection of Klimt’s valuable artworks by Lederer’s son Erich. To tell the truth, the heirs do not insist on exportation of the Beethoven Frieze nowadays and agree with its current housing in Vienna. 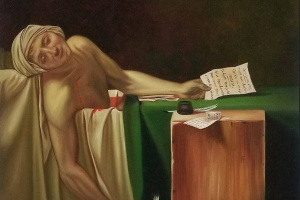 Вот картина к эпосу ,,Калевала,, Тамары Григорьевны Юфа , нашей карельской художницы.Стиль модерн. точно, и - здорово очень! спасибо, что поделились! Ольга! Мне посчастливилось познакомиться с этой талантливой художницей и она подарила мне книгу с ее иллюстрациями и с дарственной надписью.Мне в жизни повезло , я лично знакома с несколькими нашими карельскими художниками . Они стареют , надо сделать в АРТХИВЕ страничку , что-бы сохранились воспоминания об этих талантливых людях..Они ведь сами труженики и о себе сами рассказывать не будут. ПОПЫТАЮСЬ! ТОЛЬКО ПОПОЗЖЕ !! !Праздники на носу!! !